The Bosch 1/8 In. SDS-plus® Bulldog™ Xtreme Mortar Knife is designed to remove mortar in vertical joints while not damaging the brick. It is only 1/8 In. wide. The narrow width, the blunt tip and the plunge blade is designed for greater efficiency, without binding to brick. The plunge depth allows the user to remove mortar to proper depth, to eliminate the “half-moon” remainder often left over by diamond blades – allowing for professional results. The straight edge removes debris quickly and easily. 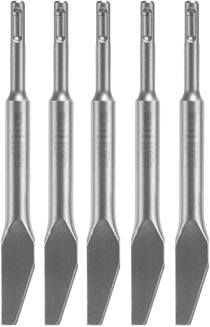 The SDS-plus® shank is designed for fast power transfer and control.